Speaking to reporters in Brussels, Juncker spokesperson Natasha Bertaud denied speculation that Bratušek, the former Prime Minister of Slovenia, has withdrawn her candidacy to be part of the next EU executive. At the hearing, in addition to having been too vague on policy issues, Bratušek was criticised for having appointed herself as Commissioner, during her last days as prime minister, after losing Slovenia’s July election. “We strongly deny this. 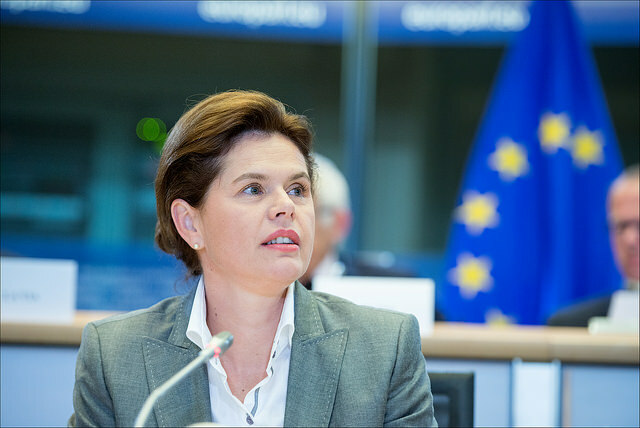 Ms Bratušek is the Commissioner-designate from Slovenia, and I would not speculate on any other scenarios before the European Parliament gives its assessment on her hearing,” Bertaud said. Bertaud also stated she could not confirm rumours in the Slovenian press that that Bratušek had requested a second hearing, to make her case to MEPs. Bratušek denied on Facebook that she had thrown in the towel. She blamed “compatriots” for spreading rumours and denigrating her. In fact, the rumour started with a tweet by Ulrike Lunacek, a Green MEP from Austria, who tweeted this morning that Bratušek had withdrawn her candidacy. In fact, a Conference of the Presidents of the European Parliament is due tomorrow. Its verdict is expected to be that without a number of changes, Parliament will not be able to vote in favour of the Juncker Commission, as it was proposed on 10 September. Bertaud said that Juncker is in permanent contact with the President of the European Parliament Martin Schulz, the leaders of the main political groups and with the Commissioners-designate themselves, and that he was in “listening mood’. Rumour has it that Juncker spends a lot of his time speaking on his mobile with the persons concerned. Speculation that Bratušek has quit may be premature. MEPs may ask not only for her scalp, but also that of Spain’s Miguel Arias Cañete, despite the fact that his political force, the European Peoples’ Party (EPP) still supports him. Bratušek, in theory, is a liberal. In fact, she only recently created a liberal party that has just four MPs, and is not yet affiliated with the ALDE group in the EU Parliament. One way of deciding on Bratušek’s fate is for MEPs to invite her for a second hearing, as they did for the UK’s Commissioner-designate, Jonathan Hill. MEPs already voted to accept Hungary’s Tibor Navracsics in another role on the European Commission, but asked Juncker not to assign him the Education, Culture, Youth and Citizenship portfolio that the President-elect had originally proposed. This will mean more hearings to come, and difficulty holding a vote in plenary for the Juncker Commission, on 22 October. On that day, MEPs can only endorse or reject the entire commission. · 1 November: Commission enters in office. Accurate information always gives a great backup of knowledge and I actually like the best topics.